If concrete surfaces are looking all old and boring, there is no reason why anyone should accept it as it is. 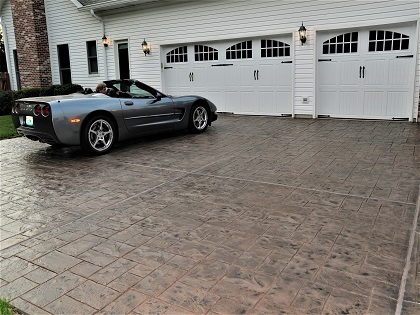 If budget is holding you back, concrete overlays are one of the affordable concrete surface repair solutions. An overlay or coating is poured on a concrete slab and leaves it to dry and adhere to the existing slab. This concrete floor coating can be customized to look more appealing without compromising durability and function. Resurfacing concrete in Indianapolis with overlays is a more practical alternative to removing the slab and replacing it with a fresh batch of concrete. The latter option requires more time for the removal and curing. It would also involve additional services like slab disposal, mixing, leveling, and more. With all those considered, expect to pay more for material and labor. Stamped Overlay – If you want a flagstone pool deck, there is no need to buy several stone pieces and have a mason install each piece one by one. This traditional method is expensive and requires a great deal of time. Now, pool deck concrete overlays can replicate the same look with just an overlay, stamp mats, concrete stains, and a skilled artisan. Stained Concrete – Similar to stucco, but with a less intense texture, this slip-resistant coating is popular for use on pool decks, patios, driveways, and other outdoor surfaces. It is also capable of reflecting heat back, making the surface 30% cooler to the touch than other paving materials. Knock Down Texture – This is an acrylic coating that is sprayed down on the surface instead of poured and spread out using a roller brush or trowel. The spraying sends splatters of material on the surface which are then knocked down using a trowel. This process creates a subtle texture that is slip-resistant but still comfortable underfoot. Epoxy Flooring – Epoxy has always been known to be a durable material. The epoxy coating is just as durable and this coating is ideal for garage floors, whether it is in a residential, commercial, or industrial setting. Although simple to install, it requires great skill and experience to be able to mix equal parts together, blend them well, and apply it uniformly across a slab. Call (317) 854-4529 for inquiries on decorative concrete overlays. Indianapolis Concrete Artisans is an Indianapolis decorative concrete resurfacing installer that offers top quality overlays for resurfacing patios, pool decks, driveways, walkways, and entryways. We have a full line of decorative concrete flooring solutions that provide nothing but durability, functionality, and aesthetics you won’t find anywhere else. We take pride in our work. We pay great attention to detail. That’s why we see so much repeat business. What are you waiting for? Pick up your phone and call us now. One of our friendly staff will take your call and schedule you for a free consultation and quote, fast and free!